Walter Becker and Donald Fagen first met in New York 1967. The guys started playing and writing songs together and came to the conclusion that musically, they had quite a bit in common with one another. After Fagen graduated from college the pair relocated to Brooklyn, where they began touring with a band called “Jay and the Americans.” They were soon hired by ABC Records as songwriters, and moved to California, where they started a band of their own with singer David Palmer, guitarists Denny Dias and Jeff “Skunk” Baxter, and drummer Jim Hodder. They chose the name Steely Dan, which was the name of a scandalous accessory in a novel by William Burroughs. The band recorded its first album, and “Can’t Buy a Thrill” was released in October of 1972. The album would eventually sell more than a million copies in the United States. The record produced the singles “Do It Again,” which went to #6 on the charts and “Reelin’ in the Years,” which placed #11. In 1978 the band released the album “Aja.” The record sold very well and was eventually earned double Platinum certification. Not only did “Aja” make it all the way to the #3 spot on the charts, it earned the Grammy Award for Best Engineered Non-Classical Recording in 1978. The guys took a break for the rest of 1978 and things didn’t exactly go smoothly for the next little while. Becker’s girlfriend overdosed and died in their apartment, which resulted in a lawsuit. Becker was also hit by a car while crossing the street in New York City, which resulted in a broken leg. Fagen and Becker were also sued by a jazz musician who claimed the guys had used one of his songs without permission. Despite all of this, they released “Gaucho” in November of 1980. The album charted in the top ten and sold more than a million copies. Becker and Fagen parted ways at this point, and unfortunately “Gaucho” would be Steely Dan’s last album for 20 years. Becker and Fagen continued to work on solo projects as well as with other musicians and began to tour together again in 1993. “Citizen Steely Dan,” which is a box set, was released in 1994, and a compilation of live songs from 93-94 “Alive in America,” was released in 1995. The guys started work on their next studio album but it would not see the light of day until February of 2000. Fortunately, “Two Against Nature,” was worth the wait. The album debuted at #6 on the charts and eventually sold more than 2 million copies in the US alone. By the end of 2000, “Two Against Nature,” had won 4 Grammy Awards, including Album of the year, and the band was inducted into the Rock and Roll Hall of Fame. The band’s last album to date, “Everything Must Go,” was released in 2003. 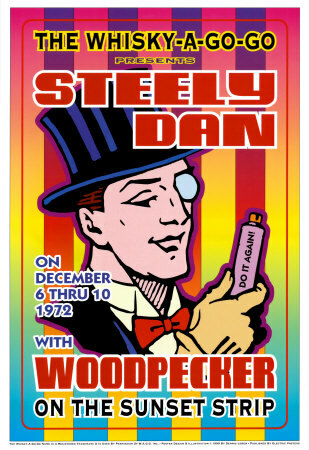 As of 2009 Steely Dan is still touring around the world.